You’ll have to forgive…not only for the long wait in between but also for the lack of story to go with this recipe. The truth is, Ryan, Ben and Bella are all on the couch right now…giggling and goofing around. I was up a little early whipping up these muffins before the gang made their way downstairs…as a sweet Saturday morning surprise. But they are here now, so I want to get to them right away. These mornings together are precious. This recipe is so good however, that I wanted to get it to you…should you want to do the same tomorrow morning. 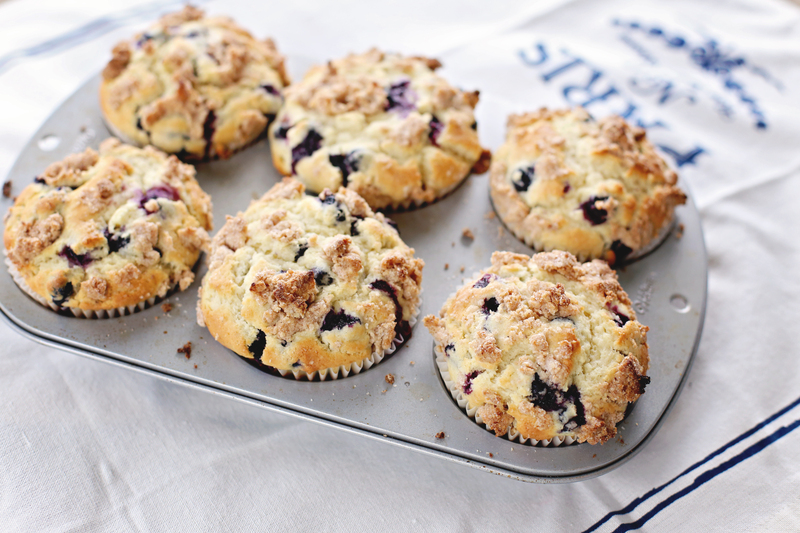 Enjoy these delicious muffins with your favorite coffee. And because I don’t ever follow a recipe exactly, I did double this recipe to make jumbo muffins (because seriously, jumbo muffins are way more fun), added a few extra ‘berries, and a quick shot of vegetable oil to moisten them up just a titch more. Really?! Snow in the forecast?! Is it THAT time of year already? Here I was so excited to wake up and share this “fall” recipe with you….and instead, I oughta be sharing a recipe for hot cider…or something else that might warm you to your core. Oh well 🙂 The recipe below with satisfy your sweet tooth while we dream up the next warm-your-toes treat! So…on Sunday morning, we did just that. 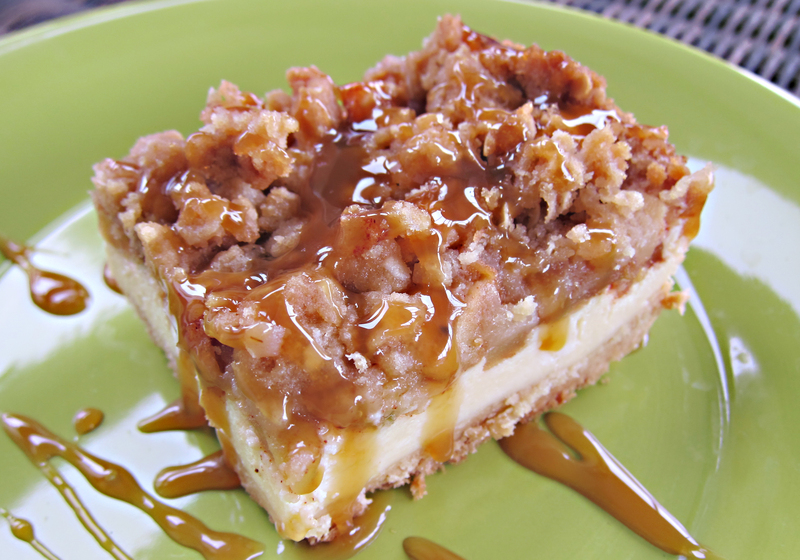 We whipped up a batch of this indulgent dessert and packaged them to share with some of our neighbors. 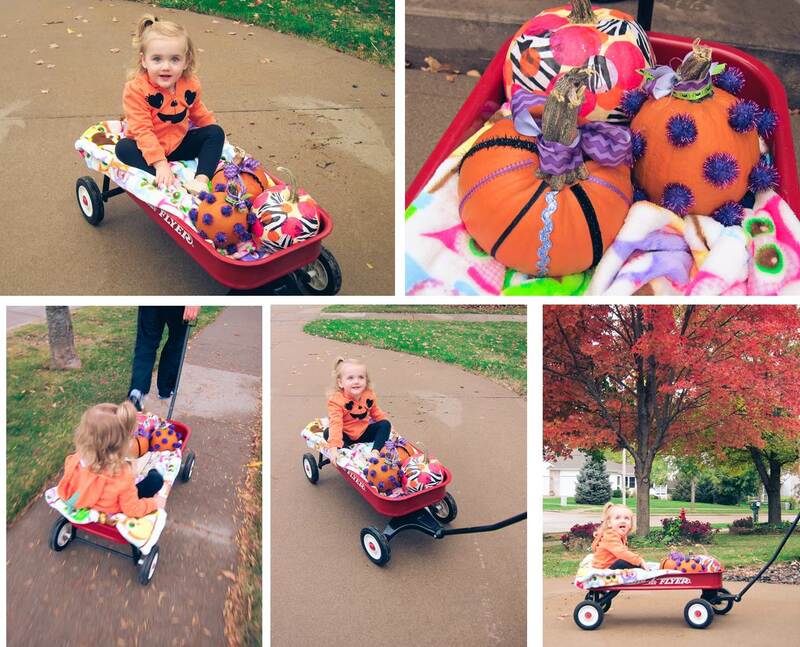 That evening, Bella loaded up some of her “punkins”…decorated over that last few weeks….and headed out in the wagon. At each door…she handed over a pumpkin and some bars. She was so proud! At the last stop “Auntie DeeDee’s”, she gifted her pumpkin, shared her bars…and then proceeded to take off her coat, welcome herself in, and kick Mom and Dad out! What a riot. She loves her DeeDee and while we hadn’t intended on walking home with an empty wagon, she made it clear she was staying. Thank you Deanna for loving our girl. She sure adores you! If you are up for a little baking this week…try this delicious Fall recipe while the apples are ready and plentiful! And…if you can, share a few with your neighbors. Wow! What a weekend. After 2 weeks of feeling pretty miserable, I was ready to pack in as much celebration and relaxation as possible! In addition to an anniversary, we had a very special birthday to celebrate! Speaking of “where does the time go? !”, the first love-of-our-lives, turned TEN on Friday. What?! 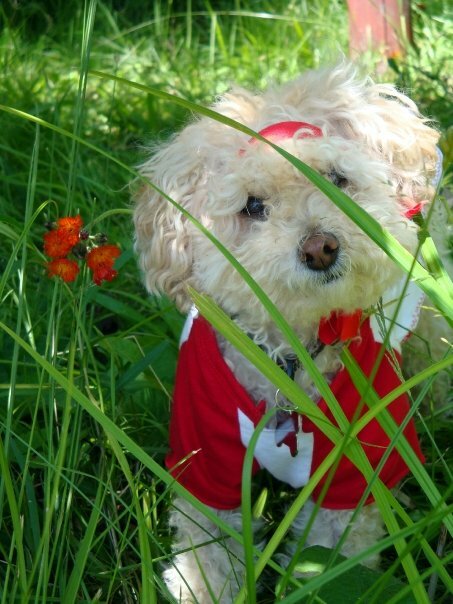 Ruby Tuesday…aka, Pickle Monster, rang in a decade. I know this phrase gets over used all the time but, seriously, I don’t know what life would have been like without this little dog! Ruby is sooooo HUMAN. I will never forget the time (ok, one of the many times) we smuggled her into a hotel…and Ryan would say, “Hey…she’s more human than half the kids here.” True story. Ruby is smart….funny…compassionate…protective…and without question, one of a kind. As she ages, she drives me more and more crazy with that dang ball…wanting to play fetch CONSTANTLY. But with every toss, I’m grateful she’s still here to bring it back. She’s been a great little dog…and an awesome “big sis” to Bella. We love you , Ruby! 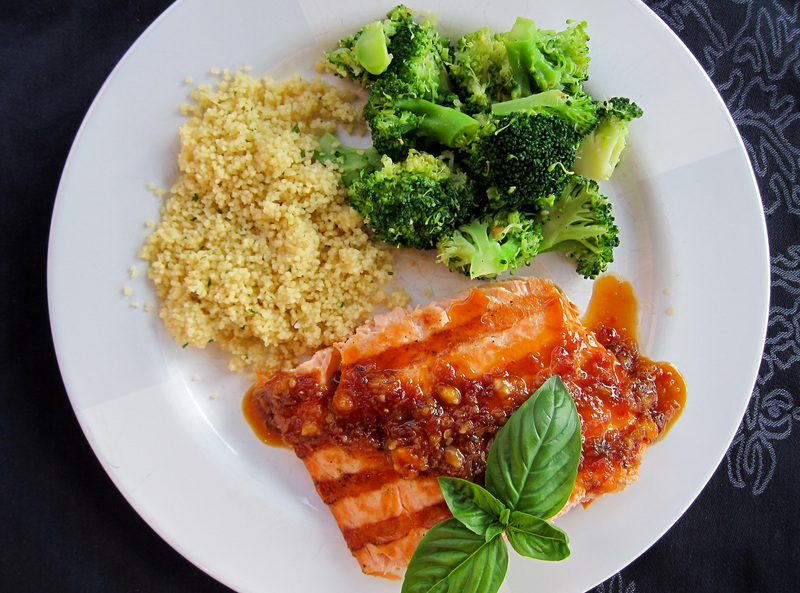 So for all the salmon lovers out there, enjoy this quick and easy weeknight salmon recipe. You can’t go wrong! While the grill heats, combine sauce ingredients and bring to a boil. Reduce to low heat and let simmer. Rub salmon with EVOO and salt & pepper. Lay the fish, skin-side down, on the grill. Cook for 4-5 minutes, flip, and cook for 2-3 minutese longer (for medium). Serve salmon hot, and top with the “spicy sauce”. Plate up a few of your favorites on the side! 20 weeks. Really? There is a part of me that says, “Wow…this pregnancy is flying by.” And then, there’s this other part of me that screams, “That’s IT? !” Whatever the case, we are half way there…half way to Christmas…half way to a baby we hope is our greatest gift yet. While yesterday marked 20 Weeks, today is our “Official” Ultrasound at UIHC. I’m nervous. I’m excited. I’m ready to take a another peak at this blessing we know as Baby B3. Will our ultrasound with Abbey prove right again? Is Beau sending us another little boy? Most importantly, will he be healthy? Prayers sent. Fingers crossed. Unlike my pasta cravings when I am NOT pregnant, the first trimester brought an interesting craving for me…ALFREDO. Fortunately, I was sharp enough (despite the extreme exhaustion) to look up a “healthier” alfredo…or at the very least, a “lower cal…lower fat” option. To my surprise, this Cooking Light recipe hit.the.spot. In fact, I’ve whipped it up a couple of times for friends as well. And, there were “thumbs up” all around! 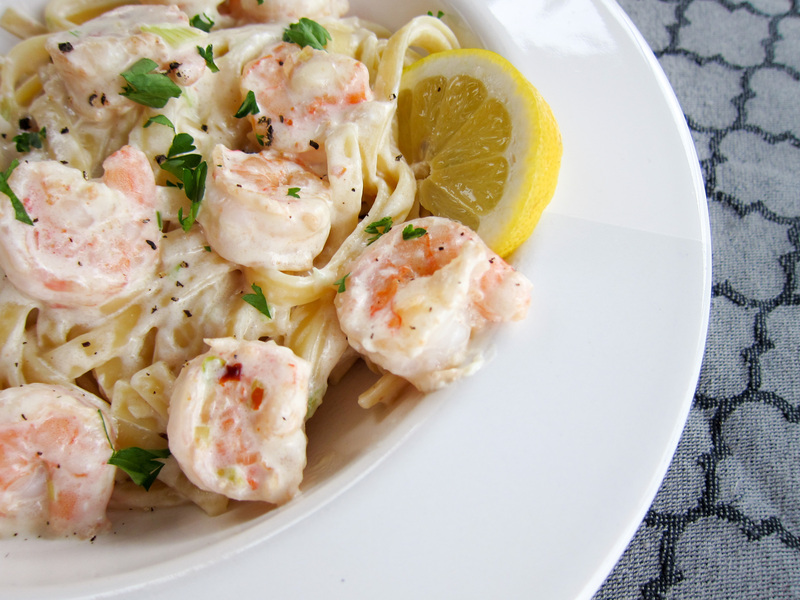 If you, like me, suddenly crave an alfredo dish, give this one a try! I think you will be pleasantly surpised….and there will be zero guilt afterwards! INDULGE! 1 (9-ounce) package refrigerated fettuccine (I used FRESH fettuccine noodles). My addition…a splash or two of dry white wine! Cook the pasta according to package directions, omitting salt and fat. Drain pasta in a colander over a bowl, reserving 1/4 cup cooking liquid. Combine shrimp, onions, and garlic in a small bowl. Heat a large skillet over medium-high heat. Add olive oil; swirl to coat. Add shrimp mixture, and sauté for 4 minutes or until shrimp are done. Remove from pan; keep warm. Reduce heat to medium. Add reserved cooking liquid, Parmigiano-Reggiano, half-and-half, cream cheese, white wine, and pepper to pan. Cook 2 minutes or until cheeses melt. Combine pasta, cheese mixture, and shrimp mixture. Good Morning! Long time no post! The trouble is, I have so many recipes and photos piling up that I am dying to share with you. And…selfishly, get posted to “my” online cookbook. See, so often, as I’m wandering the aisles of HyVee, I have Indulge pulled on my phone as my “go-to” recipes and grocery lists. I’d be lost without this blog! Funny…I still carry a paper calendar/planner…but when it comes to recipes, it is all electronic. Somtimes I think my cookbooks are just sitting on the shelf to look pretty! Speaking of months…it was almost 3 months ago that we traveled to Northern MN to celebrate Ryan’s Grandma Maki. It was Mother’s Day weekend…and seemed appropriate that we were joining in a Memorial for Gram. I loved that little lady…so very witty…and sassy…just how I like ’em! I suppose, it was also quite appropriate that after losing Beau in January, we were also newly pregnant with the baby are now expecting on Christmas. So, as a first trimester reprieve, we extended our stay on the North Shore for a few days at Grand Superior Lodge. Those of you who have been following the blog since it’s start know that GSL is one of my very favorite places on Earth. Rustic. Tranquil. And the ultimate in relaxation. We were thrilled to be joined by our friends the Loftsgaardens. Spending the days individually with our families and joining up in the evening to share homemade dinners (and letting the kids run wild together). As I pondered what to make, I decided to go for a new recipe. Despite Ryan’s argument, “When cooking for guests, we should make something we KNOW is good”, I rebelled. 🙂 I was craving something new! Maybe it was the simplicity or maybe it was the title “You Won’t Be Single for Long Vodka Cream Pasta” that tempted me, but it was Rachael’s Rays Vodka Cream Pasta that made the cut. What resulted, after a few tweaks of my own, was rave reviews! So, the next time you are looking for an easy…but guaranteed delicious pasta dish, you will have to give this one a try. It would be hard to go wrong! Original Recipe by Rachael Ray – adapted to our taste! Heat a large skillet over moderate heat. Add oil, butter, garlic, and shallots. Gently saute shallots for 3 to 5 minutes to develop their sweetness. Add vodka to the pan, 3 turns around the pan in a steady stream will equal about 1 cup. Reduce vodka by half, this will take 2 or 3 minutes. Add chicken stock, tomatoes, crushed red pepper. Bring sauce to a bubble and reduce heat to simmer. Season with salt and pepper. While sauce simmers, cook pasta in salted boiling water until cooked to al dente (with a bite to it). While pasta cooks, prepare your salad or other side dishes. Stir cream into sauce. When sauce returns to a bubble, remove it from heat. Drain pasta. 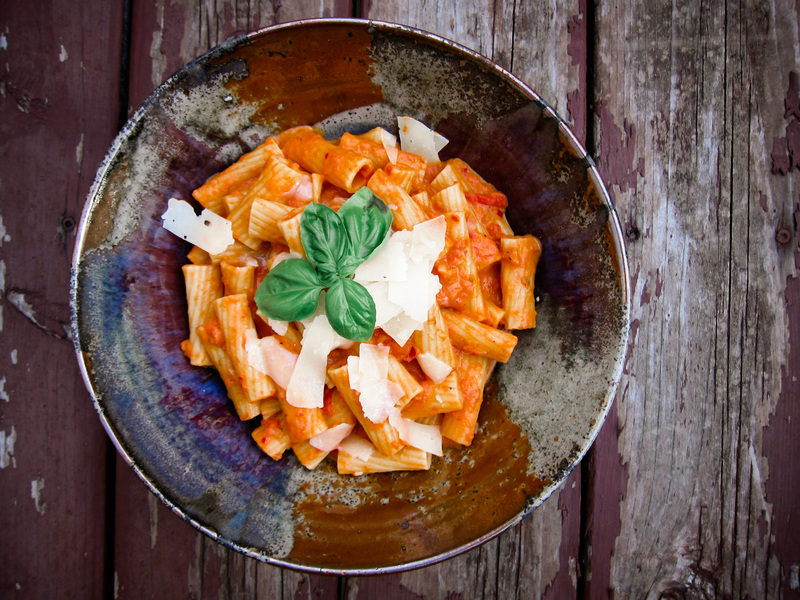 Toss hot pasta with sauce, shaved parmesan, and basil leaves. Pass pasta with crusty bread and serve with your favorite red wine! Have you ever had something to eat, whether it was at a restaurant or prepared by a friend that you thought to yourself, “I LOVE THIS.” And then, for weeks and months afterwards, you crave it?? The craving leaves you desperately wracking your brain trying to master it? Ok, call me crazy, but I have. Last fall, we spent a fun evening with our friends, Erin & Ryan Spengler. While Erin and I played with the munchkins in the backyard, Ryan and Ryan chit-chatted in the kitchen and whipped up a couple of amazing homemade pizzas. (Ok, my Ryan sipped a glass of wine while he watched the other Ryan make pizza.) The first ‘zza to hit that table was a Barbeque Chicken and the second, “The Farmer’s Market”. That morning, while strolling the market, Ryan (Spengler) had picked up a variety of peppers, leeks, onions, garlic, goat cheese, and fresh basil. And for us, he whipped it all up into this delicious pizza I have been craving ever since! Let me tell ya, last night he rocked it! Creating the perfect crust was the real kicker in this process but also deciding on the right toppings, in the right order, were crucial. Paired with one of my favorite bottles of wine, a Dry Creek Valley Zin, this pizza was just exactly what we’d hoped it would be. As I wrapped up my Cleanse phase of Advocare’s 24 Day Challenge, indulging in a carb-o-licious meal was in order! We owe Ryan Spengler a HUGE thank you for introducing us to this recipe and spurring this challenge…re-creating “Farmer’s Market Pizza”. For us, the crust was especially important. While I’m usually a thin crust fan, I wanted this pizza to be much like Spengler’s…fluffy, airy, bubbly! To accomplish this, we used a “Pizza Crust Mix.” (Since we didn’t have Ryan’s amazing dough recipe). Added to the powder mix was a few dashes of garlic salt and 1/4 pkt of quick rise yeast (1/4 of a 1/4 oz pkt…not much). Upon mixing as directed, the dough sat, covered, for 2-3 hours (or longer if you are able). Ryan then rolled out the dough on our pizza stone and let it rise for 1 hour. From there, he baked as directed. IF you aren’t up for fussing with dough, certainly, use your favorite pre-made crust. 1. While dough is rising, saute on medium-low heat, peppers, onions, leeks, and 1 clove of garlic in butter until all are semi-soft. Set aside. 2. In a small bowl, combine EVOO, 2 cloves minced garlic, and torn basil leaves. 3. 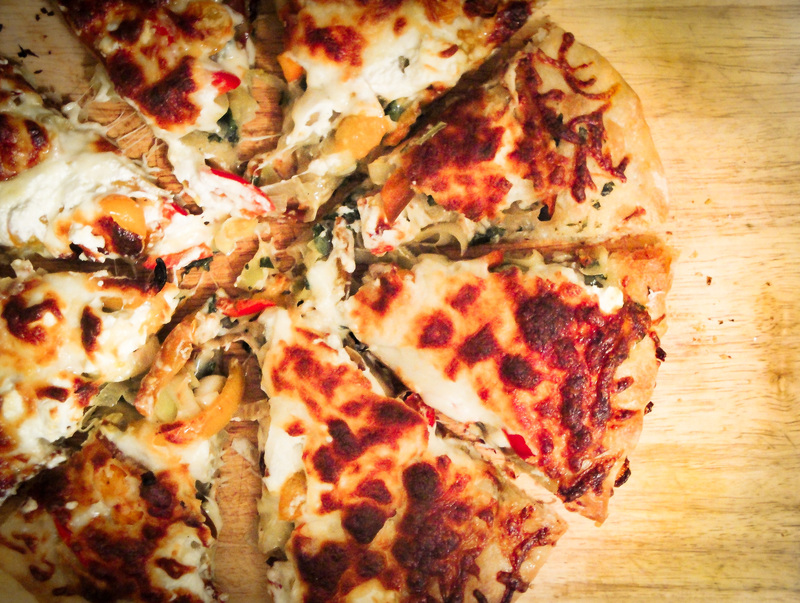 Once crust is removed from oven, build your ‘zza! Start by brushing the crust with the EVOO mixture. Be sure to spread evenly. Next, create a layer of chopped spinach leaves. Top with the sautéed peppers, onions, and leeks. Sprinkle crumbled goat cheese (generously). Finish with freshly grated mozzarella. 4. Bake pizza for ~10 minutes at 425 degrees until crust is ready and cheese is starting to brown. 5. Remove from the oven and let sit for 5 minutes. Slice and serve! What can I say? I have a new favorite pizza! It just might…yes might, be on the menu again tonight! I can hardly believe a week has passed since we lost our sweet little boy. The week leading up to “Goodbye” seemed so long and torturous…while this week flew by…a rollercoaster of tears, numbness, and peace. While Ryan eased back into the hustle and bustle of work, frantically writing and pursuing looming deadlines, I took each day as it came. While my body slowly healed, I tackled a list of to-dos, a list of activities that would help ease my heart and my mind. From returning my maternity clothes to compiling a box of mementos to piecing together a book of FB messages, texts, and emails to picking up his ashes, I used every hour I had to find a permanent place in our home and hearts for Beau, find peace and understanding for myself, and find a sense of normalcy for our family. During an evening conversation with Ryan, he suggested starting a new tradition…whether it be once a week or once a month, regularly doing an activity for Beau…an activity he would have enjoyed, so that he is forever present and in some small way, a part of Bella (and future children’s) lives. I stood amazed (and tearful) as Ryan made his thoughtful suggestion…I couldn’t help but wonder, “Where did this guy come from?! What an awesome Dad.” As it turns out, though much more quietly than me, he too has spent the week searching for our new normal. In this week-long journey toward healing, I asked myself over and over again, “Robin, why did He choose you?” and “Robin, how are you going to make the most of this loss, this hurt, this lesson, this GIFT?” Ironically, messages and phone calls continued to come in encouraging me to write a book. At first I thought, “Really? Where would I find the time? !” But then, my wheels wouldn’t stop spinning. Before I knew it, I had a page full of bullet-points…a page full of details I would be honored to share with the world. So, logically, I scoured Barnes and Noble, Amazon, and the web for current titles…books already published on this painful process. Not surprisingly, I found THREE. There are countless books on miscarriage and infant loss but only three (that I could find) on pregnancies like ours. Pregnancies that “are not compatible with life” evidently are also pregnancies “that are not talked about”. Perhaps it’s too painful? Or somehow, too shameful. But then maybe, just maybe, that is my role in all of this. Maybe I should write a book? What do you think? As I alluded to above, the outpouring of support has been humbling. I realize now, that it isn’t until the darkest of days, that we fully realize the love and support that surrounds us. I will be the first to admit, it was just a few months ago that I spent a Saturday afternoon crying on the couch, missing my friends and family in MN and WI, feeling so alone in Iowa. And then, fast forward to January 12th and we are surrounded by more love, encouragement, and support than I could have ever dreamed. So many of those cheering us on and lifting us up were right here…right here in Iowa where I somehow had felt so alone. To all of those friends, I cannot thank you enough. We will never forget your thoughtfulness, compassion, or sincerity. One of these special friends, also dropped by with a delicious dinner. Not only were we so grateful to have dinner prepared for us but Ines made us a meal we’d never had…a version of Julia Child’s Beouf Bourguignon. Delicious! 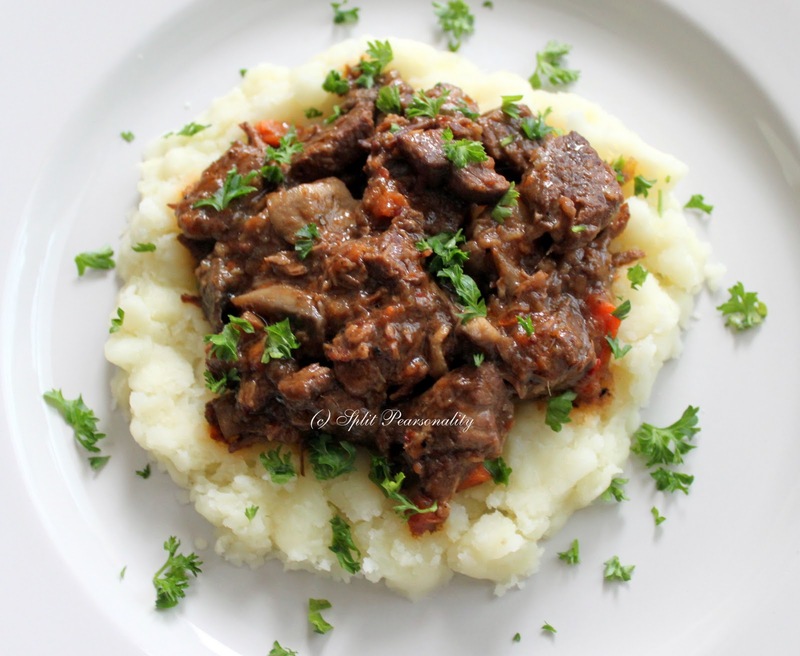 Whether you are looking for some gourmet comfort food or a meal to please the “Meat and Potatoes” lover in your household, you really need to give this recipe a try. They say “Chicken soup is good for the soul”…well, I beg to differ. They haven’t had Beouf Bourguignon! 1 Blanch the bacon to remove its smoky taste. Drop bacon slices into 2 quarts of cold water, bring to a boil, and simmer 6 to 8 minutes. Drain, rinse in cold water, and dry on paper towels. 2 In a large frying pan, sauté the blanched bacon to brown slightly in a little oil; set them aside and add later to simmer with the beef, using the rendered fat in browning. Brown the chunks of beef on all sides in the bacon fat and olive oil, season with salt and pepper, and put them into a heavy-bottomed Dutch oven or covered casserole pan. Cut the bacon into 1-inch pieces and add to the pan. 3 Remove all but a little fat from the frying pan, add the sliced vegetables and brown them, and add to the meat. Deglaze the pan with wine, pouring it into the casserole along with enough stock to almost cover the meat. Stir in the tomatoes and add the herb bouquet (and the bacon). Bring to a simmer, cover, and simmer slowly on the lowest heat possible, either on the stove or in a preheated 325°F oven, until the meat is tender, about 1 to 2 hours. 4 While the stew is cooking, prepare the onions. Blanch the onions in boiling water for 1 minute. Drain and rinse in cold water to stop the cooking. Slice the end tips off of the onions, peel the onions and score the root end with 1/4 inch cuts. Sauté onions in a single layer in a tablespoon or two of butter until lightly browned. Add chicken stock or water half way up the sides of the onions. Add a teaspoon of sugar, and season with salt and pepper. Cover and simmer slowly for 25 minutes or until tender. The onions should absorb most of the water. If there is water remaining after cooking, drain the excess. Set aside. 5 Prepare the mushrooms a few minutes before serving the stew. Sauté quartered mushrooms in a few tablespoons of butter and olive oil until browned and cooked through. 6 When the stew meat has cooked sufficiently, remove all solids from the sauce (except the beef) by draining through a colander set over a saucepan. Return the beef to the casserole. Press juices out of the residue into the cooking liquid, then remove any visible fat and boil down the liquid to 3 cups. Off heat, whisk in the beurre manié, then simmer for 2 minutes as the sauce thickens lightly. Correct seasoning and pour over the meat, folding in the onions and mushrooms. To serve, bring to a simmer, basting meat and vegetables with the sauce for several minutes until hot throughout. Serve with rice, pasta, or potatoes. Pair with a nice glass of red wine and enjoy! Thank you, Ines, for preparing a delicious and soothing dinner. You are so very thoughtful! To all of our family, our friends, and Indulge followers, today I share with you our story. There will be no delicious recipe at the end of this post or photos to wet your appetite. Instead, you will find our journey, one we must share as our recipe for healing. It’s been nearly a week since I posted a vote on Facebook. As many of you know, we were 15 to 16 weeks pregnant and wondering…were we expecting a girl…or a boy? By Monday evening, we were headed to Cedar Rapids to do an ultrasound with our dear friend Abbey, just as we had during our pregnancy with Bella. Abbey greeted us with her warm smile, and we joked about just what exactly we’d find. Would Bella have a sister…or a brother? Would I need to start shopping or would Bella’s wardrobe become hand-me-downs? Just before starting the scan, I looked to Abbey and said, “Abbey, remember, if you see that something is wrong with the baby….tell me. It is okay to tell me.” In her compassionate and professional voice, she said, “Of course. It won’t be official, but I will tell you.” This was the same conversation we’d had before scanning Bella. I’ve always been comfortable with miscarriage. In fact, I’ve always found it to be a truly amazing function of the female body. And I’ve always accepted the potential for this to occur… as well as defects, abnormalities, malformations…they are all possible. 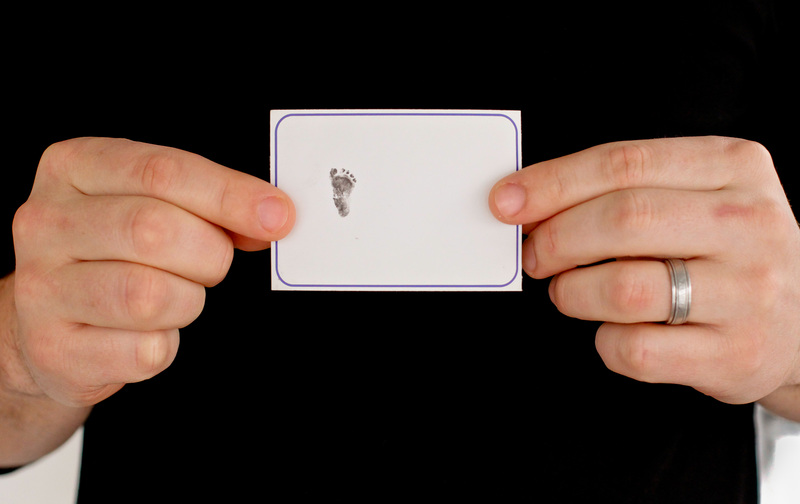 From there, Abbey began scanning the rest of his tiny body. As she approached his head, I immediately felt my heart sink. I calmly but abruptly said, “What’s wrong with his head?” It was clear to the three of us that something was drastically wrong. Unfortunately, there was no one in the office to call in, no one to grab a second opinion from, no one to make sense of what we were seeing. Poor Abbey tried to find comforting words and encouraging explanations, but clearly, we had all shut down. Ryan, having a background in neuroscience, knew that Beau’s skull and brain were malformed. Even I, from the few images I could make sense of, knew the diagnosis and prognosis, could not possibly be good. After a night of tears, questions, and mounting fear, I called the University of Iowa Hospital immediately on Tuesday morning. I pleaded with them to see us….how could we possibly wait? Despite my efforts, we were encouraged to visit on Wednesday with the Fetal Genetics Team. The rest of Tuesday was torturous. What was wrong with our son? Had I done something wrong? Was there something wrong with us? Could he live? And most gut-wrenching of all, would we be asked to choose? In those hours, Abbey met with two of the OB Physicians in her office. Though extremely rare, both physicians believed that Beau suffered from some form of acrania (missing skull) and that the severity of the defect would leave virtually no chance for survival. Through the tears, I prayed. I prayed over and over again for God to make Beau’s condition clear to us. I prayed for clear scans, absolute diagnoses/prognoses, and for the decision to be HIS, not ours. With the help of a dear friend, I also prayed that we would be given no more than we could handle. No less…but no more. As we sat in the waiting room at UIHC on Wednesday morning, I was consumed with fear, guilt, and pain. I remember scanning the room and fighting terrible thoughts…terrible questions about the others that sat around us. Through the frustration and anger, I reminded myself that being a good parent, a healthy 30-something, and a hard-working, contributing member of society doesn’t make me exempt from heartache, tragedy, or struggle. Maybe it was just our turn. Maybe we had something to learn. Maybe, just maybe, life happens. After what felt like hours, we made our way into the ultrasound with a team of 7+ staff. I laid on that table, Ryan by my side, and baby Beau up on the screen as Doctors discerned several abnormalities throughout his body. With tears streaming down our faces, they confirmed our worst fears. Beau suffered from severe acrania (missing much of his skull) and a sizeable portion of his brain was protruding through the opening and developing abnormally. The Doctor looked at us and said, “The prognosis is extremely poor. The extent of these defects are incompatible with life.” I cannot put into words the pain and suffering that followed. How could this sweet little boy have not a chance? There would be no divine miracles. There would be no medical miracles. As hard as this was to accept, we found peace trusting this must be part of God’s plan. This WAS His plan. Somehow, we’d have to prepare for goodbye. We were losing him before we’d ever get to hold him. And yesterday, the time came to say goodbye. Yesterday, our sweet Beau was delivered and handed over to Heaven. We are completely and utterly crushed by his departure but feel so very fortunate to have had him in our lives. He is our son. He will forever be with us. And most importantly, he has taught us so very much in just 5 days…about love, about life, about the strength of our marriage, about the compassion and support around us, about parenthood, and about loss. He is nothing but a blessing, and we are proud to share his story… a story that should not go untold. Though I asked to see him, the staff urged me not to due to the extent of his head malformations, particularly, those of his face (double cleft) which were previously not apparent in the ultrasound. In addition to his cranial and brain defects, his left hand and foot were severely deformed, lending support to some type of genetic syndrome caused by a chromosomal abnormality. I trust the staff’s decision…for now we will always remember him as that beautiful little boy we’d dreamed of sharing in our future…one who probably looked so much like his daddy. As we struggle through the rest of this journey, we have so much to be grateful for. First and foremost, our biggest thanks goes to Abbey…for her honesty, her courage, and her unwavering support. Without her, we would not have caught this for yet another 5 weeks at the official 20 week ultrasound. We also thank the medical team at UIHC, for their compassion, their candor, and their care. I never wondered if I was in the right hands or the right place. We thank all of our friends and family who have cried with us and prayed with us. We thank God for answering our prayers. Though we lost Beau, we trust that this was His plan, which hopefully someday we will fully understand. And finally, we are thankful for our Sweet Bella….for her smiles and her cuddles. She was our constant reminder that the chances of Beau’s condition were akin to being struck by lightning… and that someday… we will experience the birth of yet another healthy child. It is my hope that each of you reading this story will learn something from our struggle. And God forbid, should any parent have to experience this down the road, may you feel comfortable reaching out to us. Had one of my dearest girlfriends not confided her story with me years ago, this struggle would have been much darker. May you all hug your children extra-long this evening. May you appreciate the delicacies in creating life. No pregnancy is a given. Life is fragile and fleeting. We must appreciate every gift, in every form, every day. Beau, you are a beautiful baby boy, and your memory is one we will never let go. Sweet son of ours, we will forever love you and miss you…to Heaven and back. 2012 will go down in the books as the first year we hosted Christmas. Traveling 5+ hours with Bella in the backseat (who now boycotts her car seat after 2 hours), didn’t sound like a whole lot of fun. Neither did sleeping in a guest bed…for I spend so many nights away from home as it is. So there was our decision. We’d host! As with all events and weekends that we entertain, I was excited to plan the menu(s). Fortunately or unfortunately, my pregnant brain said, “Robin, you just CAN’T do every meal…for 5 days…not this time.” Instead I focused on a full evening of heavy hor’s devours for Christmas Eve and an elegant meal for Christmas Day. It is those recipes of Giada’s that I must share with you, for they were wonderful! For the beef: Allow the beef to stand at room temperature before roasting, 30 minutes. Place an oven rack in the center of the oven. Preheat the oven to 425 degrees F.
Mix together the thyme, salt, pepper and garlic in a small bowl. Make 1-inch-long, 1/2-inch-deep slits all over the meat using a paring knife. Rub the garlic mixture into the slits and onto the rest of the meat. Place the meat, fat-side up, in a shallow roasting pan. Roast for 45 minutes. Cover the meat with foil and continue to roast until a meat thermometer inserted straight down into the center of the meat registers 145 degrees F for medium-rare, 65 to 75 minutes. Place the roast on a baking sheet and tent with foil. Allow to rest for 20 minutes. For the sauce: Combine any juices from the rested meat with the broth, marsala, arrowroot and thyme in a medium saucepan. Bring to a boil, stirring constantly. Reduce the heat and simmer until thick, 20 minutes. Whisk in the butter until smooth and season with salt and pepper. Pour the sauce into a serving pitcher. 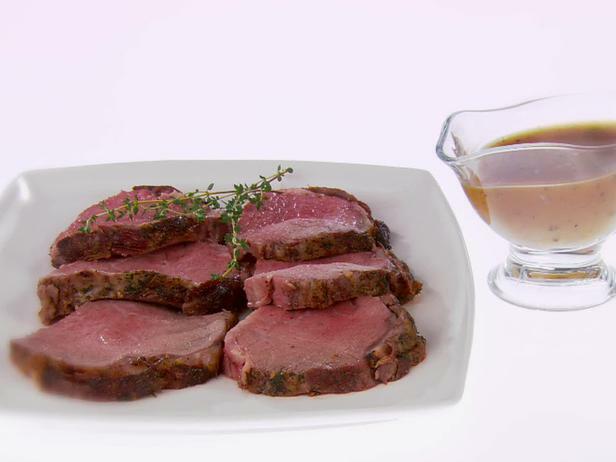 Slice the roast into 1/2-inch-thick slices and arrange on a platter. Serve the sauce alongside. For the potatoes: Combine the potatoes, garlic, salt and butter in a 5-quart saucepan with enough cold water to cover. Bring to a boil over medium-high heat. Reduce the heat to a simmer and cook until the potatoes are tender, 15 to 20 minutes. Drain in a colander and remove the garlic cloves. 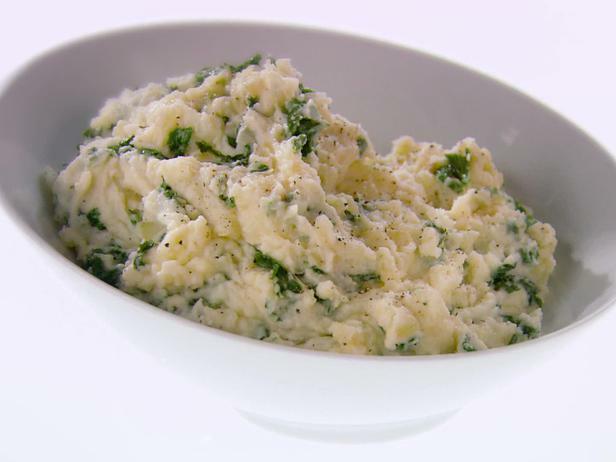 Return the potatoes to the pan and mash the potatoes until smooth using a potato masher. For the kale: Heat the oil in a large skillet over medium-high heat. Add the onion, salt and pepper. Cook until translucent, about 6 minutes. Add the garlic and cook until aromatic, about 30 seconds. Add the kale and chicken broth. Cook, stirring occasionally, until wilted, 10 to 12 minutes. To assemble: Add the kale mixture, mascarpone cheese, chicken broth, butter, Parmesan, salt and pepper to the potatoes. Stir over low heat until smooth and warmed through. Season with salt and pepper. Transfer to a bowl and serve. Like I mentioned above, we served these 2 delicious Giada recipes with a side of Roasted Parmesan Asparagus. Paired with a nice bottle of red wine, this meal was just what Santa ordered!